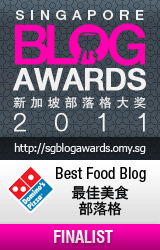 Camemberu in Finals of Singapore Blog Awards 2011 - Vote and Win Prizes! The hashtag #SBA2011 exploded all over Twitter yesterday as omy.sg quietly unveiled the finalists for Singapore Blog Awards 2011. The official announcement had not yet been made but voting's started with a frenzy of its own! I found out yesterday morning through Facebook congratulatory messages that Camemberu is one of the ten finalists in the Best Food Blog category. So I went to look. Hey, I'm in good company - there's Cuisine Paradise, Daniel's Food Diary, Foodeology, Gourmet Estorie, Maameemoomoo, and blogs new to me - 王祚森の森品堂, Aimakan, CookSnapEatLove, Malaysia Food Library 174848. Go check out their blogs on the page, all the links are there, and vote your favourite! There are more categories and more bloggers participating now, which makes it more fun. I'm finding so many unusual blogs I haven't seen before. And this year, I have so many friends who made the finals across the 16 categories. Hurray! I always say it feels like one big family! It doesn't matter who wins, because prizes can come and prizes can go, but we have already won in terms of the new friends we gain. I was looking through photos of last year's ceremony. I can't imagine that just a short year ago, things were so different. Many of us were strangers then, but today can't stop talking to each other. But still, it's nice to see there are better prizes for VOTERS this year! You stand to win prizes like a Asus Lamborghini wireless mouse, 1-Rochester Group cake vouchers, Fabrix Slim Messenger bags (I like! 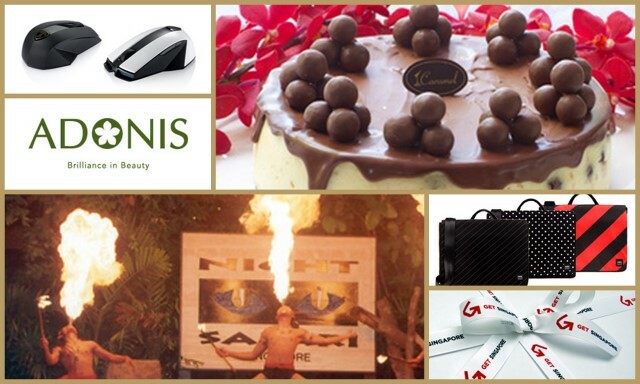 ), Adonis facial treatment vouchers, Night Safari merchandise, and Get Singapore hampers. The interface seems a lot easier this year for voting. You do still need to login just one time (or register for a free account) but the process seems much smoother. And they display all the categories you voted in conveniently on top, so you can see what you have voted and where. Overseas or non-Singaporean readers can also register and vote. I remember last year there was some confusion as to how they should fill in the NRIC/FIN details. It's easy - any ID number will do. You can vote once a day, every day, in every category. Closing date for voting is 3 July. Good luck, and have fun exploring the blogs! Thanks, Rachel and Andrew! Thank you, too, Kenny and CK! I appreciate your support! Wishing you all the best Catherine!